Alive with the pulsations of the universe, Frequency H2O is an Australian premium natural spring water sourced from a protected aquifer in remote Northern Queensland which, unlike most bottled water, is filtered naturally. Containing a rare abundance of minerals and naturally alkaline at pH8, Frequency H2O is so pure in essence, it requires no purification. 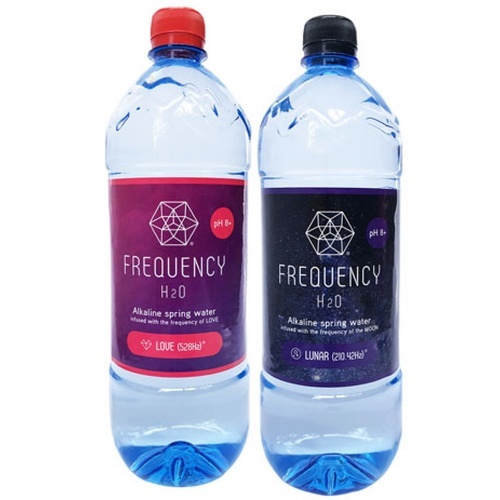 More than just a natural mineral water, Frequency H2O is a synthesis of wisdom and evolution, as it is put through a trade secret two-stage kinetic energy process and infused with a blend of ancient solfeggio and scientific frequencies. This gives Frequency H2O a noticeable texture, softness and ultra-hydrating taste, feel and effect, among other compelling wellness benefits. After sourcing this precious water from our protected aquifer in remote Northern QLD, its put through a 2 stage kinetic energy process and infused at 528Hz, the frequency of LOVE. This trade secret process enlivens the individual molecules, producing a remarkable, soft and ultra-hydrating taste feel and effect. After sourcing this precious water from our protected aquifer in remote Northern QLD, its put through a 2 stage kinetic energy process and infused at 210.42Hz, the frequency of the moon. This trade secret process enlivens the individual molecules, producing a remarkable, soft and ultra-hydrating taste feel and effect. Incredibly even lighter and thinner then LOVE 528Hz. After sourcing this precious water from our protected aquifer in remote Northern QLD, its put through a 2 stage kinetic energy process and infused 430-770THz the frequency of a RAINBOW. This trade secret process enlivens the individual molecules, producing a remarkable, soft and ultra-hydrating taste feel and effect.